I recently talked with Paulina Lis, who is heading up the North Park EcoDistrict project along with colleague Jennifer Owens, to learn more about the project. (The North Park EcoDistrict is currently in ‘start-up’ mode and the official website, northparkecodistrict.com, is under construction. In the interim the best source for information on the EcoDistrict is the Facebook page.) Paulina directed me to the Portland Sustainability Institute (PSI) as a primary source for information on what an EcoDistrict is and what Portland has been doing. A highly integrated neighborhood that is vibrant, resource efficient and engages residents in promoting human connections and well-being. It is home to smart buildings; strives to capture and reuse energy, water and waste on site; offers a range of transportation options; provides open space for people and natural areas for wildlife; and tracks tangible progress toward neighborhood sustainability over time. A comprehensive strategy to accelerate sustainable development at the neighborhood scale by integrating building and infrastructure projects with community and individual action. They are an important scale to accelerate sustainability — small enough to innovate quickly and big enough to have a meaningful impact. Sounds great, but doesn’t give much in the way of specifics on what those things mean and how to achieve them. The PSI website has additional information that flesh out the process to build an EcoDistrict. A main point is that an EcoDistricit is an area of a size where changes can be made relatively quickly and easily and tried out to evaluate effectiveness. The following graphic presents the five suggested phases and timeline (the North Park EcoDistrict is in Phase 1). Even the efforts in Portland are relatively new – launched with five neighborhoods there in 2009 – so there is not much to judge the effectiveness of the idea. I’m excited that it’s happening here – if an idea isn’t tried it’s sure to fail. Per my conversation with Paulina, the initial efforts of the North Park EcoDistrict will focus on the business community. However, hopefully residential areas will also be included in time and both residents and businesses are invited to contribute their thoughts to the project. The meeting tonight is to engage and inform the North Park community about the EcoDistrict initiative. If you’re interested please attend and voice your opinions. 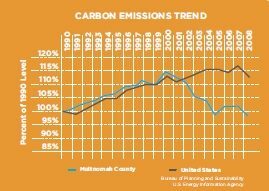 For additional encouragement, consider this graph from PSI of the carbon emissions of Multnomah County compared to the U.S. as a whole. Real changes can happen, if we are willing to put them in motion.